John Ross (of Mauchline) and John Shields (a tenant on the estate of Pollok) were captured by the dragoons during the time of the Pentland Rising. They had gone on a foray to search out whether the soldiers were in the area, but were captured and taken to Edinburgh for trial. They were sentenced to execution, which took place in Edinburgh on 7 December 1666. Their heads were cut from their bodies and sent to Kilmarnock, where they were set up on pikes on the tolbooth for public display, as a warning against rebellion. The heads were subsequently interred in the old graveyard. 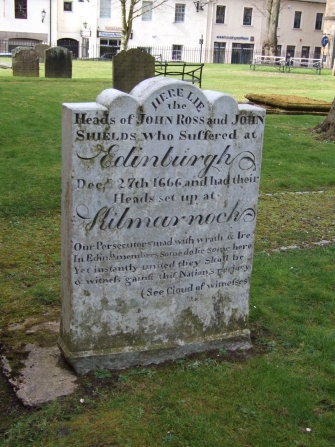 Ross and Shields' gravestone is located on the north side of the Laigh Kirk (now known as the New Laigh Kirk) in the surrounding graveyard. The church is located in the centre of the town, with access to the graveyard from John Dickie Street. The gravestone includes the date 27 December, but it is thought that the 2 was a misreading of a suberscript R, used in Decr.